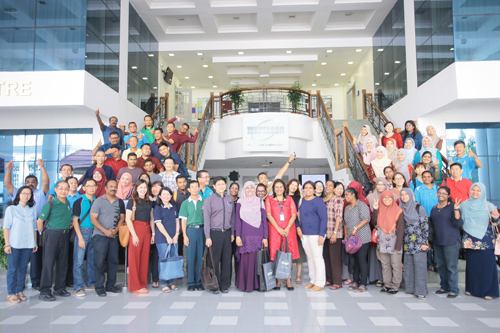 Emotional intelligence (EI) skills are helpful in managing emotions when stressed, a psychology counsellor from Universiti Sains Malaysia (USM) told an audience of over 100 teachers/non-academic staff of St Xavier’s Institution. The crowd listening to the talk on stress management. 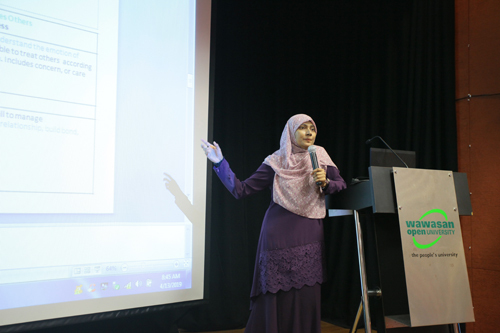 She emphasised that EI skills are needed to manage, cope and solve the emotional issues within one self and with others. She cited the four EI skills sets as self-awareness, self-management, social awareness and social skills. “Firstly, recognise, understand, and identify your emotions when stressed. If you are aware, then you can better manage your emotions, rather than react with anger.” She explained that anger, sadness and fear are natural emotions; however it all depends on how you manage them so that they do not become intense or control you, and you are more stable while you wait to find a solution. Dr Yasmin lists out the four components of emotional intelligence. As for social awareness, Dr Yasmin stated that it is the ability to understand the emotions of others, to show empathy, concern and care. “When you understand another’s emotions, it will help you deal with that person more rationally.” Social skills, she continued, relate to communication, building a bond, and teamwork. Breathing relaxation technique…Dr Yasmin requests the audience requested to close eyes and focus on their breathing. She highlighted the benefits of developing EI skills. “You gain personal resilience to face situations in life. As you build inner strength and keep emotions in check, you become a better leader and relate better with others. People with less resilience are more easily shaken, angry and sad. 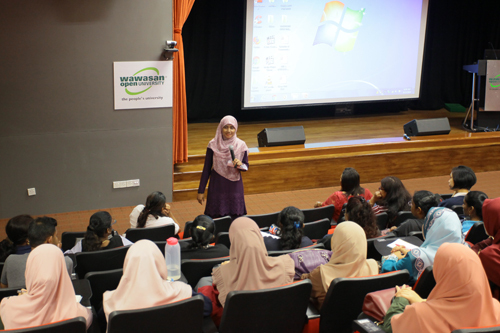 Dr Yasmin, who is also a senior lecturer and cognitive behaviour therapist at USM, said that when one experiences stress, the elements involved are emotions, behaviour and physiology (e.g. gastritis). A teacher speaks about the work stress in the schools. “Stress is in the eye of the beholder. It largely depends on how one thinks of the event. There is a connection between thoughts, emotion and behaviour. Emotional disturbances are largely due to the process of your thinking. So you listen to your thoughts. “An event becomes stressful when we think negatively, we feel negatively, and act negatively,” she pointed out, using the analogy of relationship break-ups, which can lead one to think they are useless and so isolate themselves and not want to talk. Dr Yasmin (centre), flanked on her left by Jasmine Emmanuel of WOU, poses with the participants. 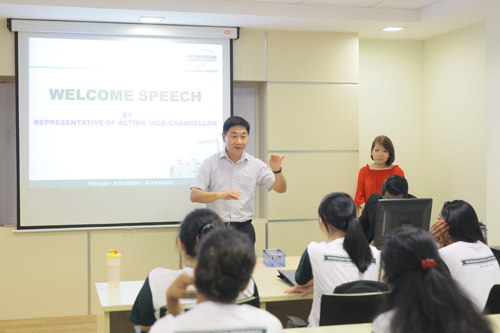 The workshop was jointly organised by the Penang Regional Centre and the School of Humanities & Social Sciences (SHSS). Among those present was SHSS Deputy Dean Jasmine Emmanuel. WOU conducted a workshop for seven doctoral degree students from Silpakorn University (SU) to equip them with practical knowledge and skills in undertaking research and preparing dissertations. The PhD students from Silpakorn University. The five-day workshop on "Refining Research Skills" for the second-year PhD students from SU, a national university in Thailand, was held at the main campus from April 8th to 15th. It was organised by the Centre for Professional Development & Continuing Education (PACE) and facilitated by the School of Education, Languages and Communications (SELC). The workshop aimed to assist the students in completing their PhD. The SU students were Prueksa Dokkulard, Napaporn Boonsri, Massaya Rungaroon, Waleerat Puttasri, Chonthicha Manosin, Naraya Sirapanuwat and Praiwan Khantasiri. Grace Lau talks about the University. The workshop kicked off today with an introduction to WOU by Director of Public & Student Relations, Grace Lau, who highlighted that WOU to date has produced 2,726 graduates from the undergraduate programmes and 1,029 graduates from the postgraduate programmes. Speaking on ‘Pedagogical Transformation’, Acting Vice Chancellor Prof Zoraini Wati Abas mentioned transforming the teaching and learning at WOU to address the skills needs of students and employers, as well as to improve sustainability, enhance retention, and increase enrolment. She declared that of the 23, 120 students enrolled in WOU as at March 2019, 62% are aged 19-32 years, adding that young learners have short attention span, demand quick responses, require just in time knowledge, and value recognition. She said that they would prefer biteable learning content delivered just in time, fast responses via LMS and WhatsApp messages, and badges or mini-certificates for their efforts. Meanwhile the Dean of SELC, Prof Balakrishnan Muniandy, in his presentation on ‘PhD Journey: Before, during and after’, offered tips on managing life before, during and after their doctoral degree. There were also presentations of other WOU researches, such as developing a scale to measure students’ psychological capital, identifying the challenges to APEL, and studying the impact of student engagement on performance. Prof Phalachandra Bhandigadi (centre), flanked by Dr Tan (4th from left) and Arathai Din Eak (4th from right) of SELC, pose with the students after the workshop. Forty students from four institutions of higher learning participated in the inaugural WOUmazing Race held at the main campus today. The institutions were WOU; Stradford International College, Prai; InfoGenius Skills Training Centre, Gelugor; and Institut Wawasan, Kulim. Each institution was represented by two teams with 5 members per team. The students warmed-up with a zumba workout led by Penang Regional Centre (PGRC) marketing & admissions officer Robin Cheah Kai Yang before teaming up for the games. Students gather in the field before the start of the event. The participants sportingly challenged each other in four station games, with 10 minutes allotted per station. The games needed speed, precision, memory and teamwork as marks were accorded for completion of the different activities and tasks. Blindfolded student, navigating the maze of cups, guided by her team members. In the Mind Your Mines game, one member, blindfolded, must navigate between overturned paper cups to collect the labelled cups in the maze, guided by his/her team members. The Tower of Breath game required participants to blow balloons placed inside cups to carry and build a 4-storey tower (10 cups), without using their hands. Using a blown up balloon to build a tower of paper cups. As for Find Your Pearls, participants were asked to remember a sequence flashed to them for 5 seconds, and then to arrange cards according to the sequence, and also answer a mathematics question. A Wet Kangaroo saw participants get into a sack, hop to collect balloons filled with water using their mouths, and bring them back to the starting point. The team must collect as many balloons as possible. Hop to the table in a gunny sack and pick up water-filled balloons with one’s mouth. Info Genius Team A emerged as champions and they were presented with 5 entry tickets to The Top Komtar by PGRC director Ching Huey Ling. The all-girl Emcee Stradfordian team came in as runner-up and received 5 entry tickets to Entopia for their effort, and in third place was WOU Team B who won 5 entry tickets to Magic World Phantamania. Thumbs up to the runners-up from Stradford. At right is PGRC director Ching Huey Ling. The event was organised by PGRC together with the Full-time Student Council committee members. The students had a fun time, after which they munched and quenched their thirst, thanks to the food trucks and stalls selling a variety of Western dishes, Indian foods, laksa, cendol, kuih, ice cream and drinks. The participants pose in front the majestic campus building with the organsing committee and helpers. WOU, in line with its corporate social responsibility, is offering a sponsorship worth over RM5 million to the teachers and students of 27 secondary schools in Penang. Happy teachers! Every participant received 3 vouchers, with each entitling them or their fellow teachers and students to a 30% rebate on total tuition fees at WOU. All 200 teachers attending the state-level “Form Six Teachers Action Plan Colloquium” hosted by WOU at the main campus today were each presented with three discount vouchers. Each discount voucher entitles the teachers or students of participating schools to a 30% rebate on total tuition fees when they register for any full-time or part-time study programmes at WOU. Penang State Education (JPN) Deputy Director Abdul Rashid Abdul Samad, in an interview, thanked WOU for its support in hosting the event. He also expressed his appreciation for the rebate vouchers from the University that spells huge benefits to the teachers and school kids. “Education is a lifelong learning process, a never ending story. When the kids go for higher learning, they must go for something higher than the first degree nowadays,” he remarked, adding that he himself has a Master’s degree. Abdul Rashid thanks WOU for helping teachers and students to pursue higher learning. He continued, “So when WOU can chip in with this kind of 30% rebate commitment, I do really appreciate it. Wawasan is doing its part with this social contribution for the school, for the kids, and we are really grateful for that. Abdul Rashid (centre) with WOU Acting Vice Chancellor Prof Zoraini Wati Abas. The 27 participating schools are from the five districts in Penang, namely Northeast (11), Southwest (2), Seberang Perai Utara (6), Seberang Perai Tengah (4) and Seberang Perai Selatan (4). In his speech when officiating at the colloquium, Abdul Rashid reiterated his heartfelt appreciation for WOU’s commitment, adding that the main campus affords a pleasant study environment with its classic building and beautiful architecture. Form Six teachers must prepare students for University, says Abdul Rashid. He called on the teachers in Form Six to play the role of “mini lecturers” in the way they engage and communicate with the students, instead of being only focused on completing the syllabus, so that the students are ready, mentally, for university. WOU Acting Vice Chancellor Prof Zoraini Wati Abas, in her welcoming remarks, stated that the University offers full scholarships to students with excellent STPM results and needy students. Prof Zoraini briefs the teachers on Wawasan Open University. 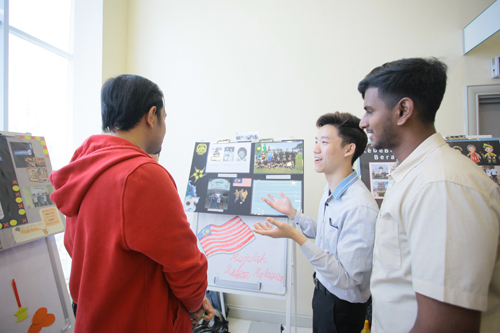 The Dean of the School of Education, Languages and Communications, Prof Balakrishnan Muniandy, shared about WOU’s educational programmes, such as the bachelor’s degree in the fields of primary education and English Studies, and the Master of Education. Prof Balakrishnan highlights the educational programmes at WOU. Student Activities Coordinator Khoo Geok Ling (foreground, right) helping the students with the barbeque. Acting Vice Chancellor Prof Zoraini Wati Abas, in welcoming the students to the event at the main campus today, advised them to use their time at WOU to make friends and build relationships. Prof Zoraini encourages the students to make lots of friends while in University. 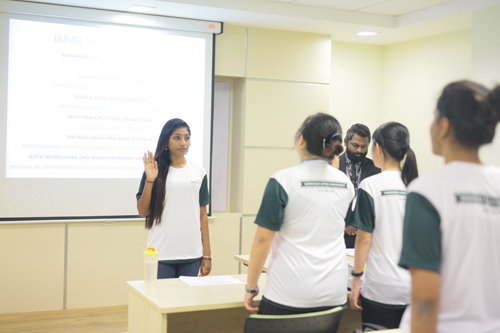 Over 40 people turned up, mainly full-time students along with a few lecturers, including School of Business & Administration (SBA) Acting Dean Prakash Arumugam and School of Humanities & Social Sciences Deputy Dean Jasmine Emmanuel. The icebreaking game requires getting to know their team members. The icebreaking activity kicked off the informal part of the evening. Four teams participated with 7 members each - six students and one staff – and they were tasked to learn each of their team members’ name, programme and hobby. A participant caught holding the ball being passed around within each group when the music stopped wasthen called to introduce his/her team members to the others. Holding the ball while introducing his team members to everyone present. Another activity, the ‘Shake Shake Shake’ game involved 3 pairs of students given a set of bottles with marbles filled inside one bottle for each round. Students had to flip the bottle over using their hands and transfer all the marbles to the other bottle. The winning duo for each of the three rounds of the game received angpows from Prakash. ‘Shake, Shake, Shake!’ the marbles into the bottom bottle. The students and staff feasted on barbecued chicken satay, chicken wings, corn on the cob, egg plants, sweet potatoes, chicken ham with enoki mushrooms, and fried meehoon which they washed down with orange juice. (Seated front, from right) Khoo, Jasmine, Prof Zoraini and Prakash pose with the students. 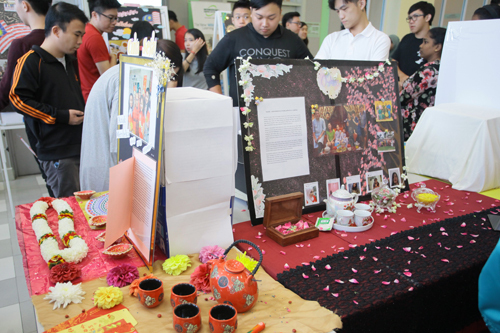 Universities are urged to work more closely with industries to spawn research and development (R&D) that can lead to the creation of innovative products to benefit small and medium-sized enterprises (SMEs). The government should also offer more support through grants and financial incentives to promote innovation for a newer generation of technology and products. Assoc Prof Dr Nualnoi Treerat (3rd from right), Director of the Institute of Asian Studies, CU, and Prakash Arumugam (right) of WOU pose with the speakers and moderator. These were highlighted by the speakers of the roundtable on “Technological Challenges and Future Opportunities for SMEs in Southeast Asian Region” jointly organised by WOU and Chulalongkorn University (CU) at the WOU main campus today. The panel speakers were Chief Transformation Officer Dr Supot Tiarawut and Director of Innovation Dr Ronnakorn Vaiyavuth of CU, along with Assoc Prof Dr Shankar Chelliah, School of Management, Universiti Sains Malaysia, and Kalai Selvan Subramaniam, co-Founder and CEO of Infinecs Systems Sdn Bhd. Event moderator Prof David Ngo, Adjunct Professor at Sunway University, introduces the speakers to the audience. Dr Supot (2nd from right) highlights the obstacles to SMEs in Thailand. Dr Ronnakorn remarked that the governments of each country should allow SMEs easy access to new technology from open source and for close industry-university partnership to create innovative products for commercialisation. Dr Shankar (centre) traces the history of small and medium-sized enterprises in malaysia. He said Korea is now a leading innovator because of the revamp of their education curriculum 20 years ago, stressing on science and mathematics which are fundamentals to technology. He also declared that Malaysian university students should undertake applied research to help solve the problems faced by the community and industry, especially SMEs. 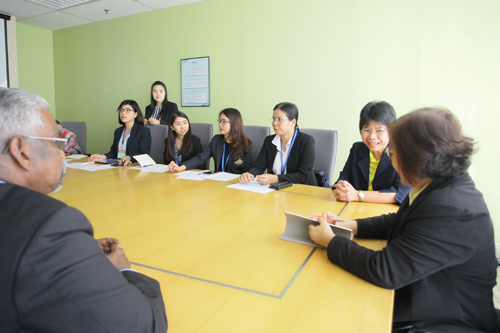 He added, “In developed countries, industries have incubators in the laboratories of universities and work together with students on applied problems, and from there they are able to commercialise the innovation.” He called on universities in Penang to build good working relationships with industry to produce and commercialise innovative products for SMEs. Kalai Selvan informed that industries like electronics and telecommunications are dominated by MNCs and GLCs, citing barriers for SMEs in Malaysia as the lack of capital and government support, and outdated government policies that support capital expenditure rather than promote knowledge workers. (From left) Dr Ronnakorn, Kalai Selvan, Dr Shankar, Dr Supot and Prof Ngo. He also called on the government think tanks, Ministries, and GLCs to open up procurement to help develop the local SMEs. Prakash arumugam, Acting dean of wou’s school of business & administration, presenting a token of appreciation to kalai selvan. The roundtable was attended by about 50 people, including WOU School of Business & Administration Acting Dean Prakash Arumugam. The WOU Chinese New Year celebration rose to new heights this year with a hilarious sketch and by incorporating a caring element. For WOU Vice Chancellor Dato’ Dr Ho Sinn Chye and Dato’ Sharom Ahmat (3rd and 4th from right) at the luncheon. Guests were offered huat kuih as door gifts and longan tong sui as starters as they sat back to enjoy the entertainment. The event at the main campus today kicked off with three Mandarin songs rendered by a group from Pusat Kesenian Muzik Micico Pulau Pinang. The crowd were howling with laughter as they viewed a 7-minute in-house video production ‘I Like Lau Juak’ which translates ‘I Like to be Merry’. Kudos to the team led by QA & Government Relations Director Dr Andy Liew and Public & Student Relations and Publishing (PSR) Director Grace Law for this hilarious production which took 3 hours to produce. The video, already uploaded to WOU Facebook, offered a satirical look into the contemporary culture of ‘expecting angpow’ during Chinese New Year open houses and of single ladies throwing oranges inscribed with names/telephone numbers to find future spouses. Grace Lau and Dr Andy Liew… the talents behind the in-house video production. In his welcoming address, WOU Board of Governors (BoG) chairman Tan Sri Dr Koh Tsu Koon lauded the production, which also featured the PSR team of Sharon Alice Wiessy, Rasidah Mion, Sharmilah Velaichamy and Rizal Omardin, along with Irmadura Ramli (School of Humanities & Social Sciences), Robin Cheah (Penang Regional Centre) and Magic Khaw (Instructional Design for Engaging Experiences). WOU will continue to hold in-house celebrations for the major festivals, says Dr Koh. Dr Koh assured that the University will continue to celebrate all the major festivals, and suggested holding an orange throwing competition since WOU is the only University by the beach. He said the lunar New Year, also known as the Spring Festival, spells new beginnings and new hope, and looked forward to WOU introducing new programmes and to perform well this year. The home-made jelly cut by (from right) Mr Yeong, Dato’ Seri Stephen Yeap and Dr Koh. The celebration also saw the cutting of a flower crafted jelly by Dr Koh, WOU Sdn Bhd Chairman Dato’ Seri Stephen Yeap and Chief Operating Officer Yeong Sik Kheong. The jelly made by Grace Lau incorporated five fishes in the design to denote abundance in relation to health, happiness, relationship, prosperity and career. Tan Sri Dr Koh and Tan Sri Dr Chin Fook Weng (right) light the firecrackers. Then followed the traditional tossing of the yee sang followed by lunch. There was also a lighting of firecrackers by Dr Koh and BoG member Tan Sri Dr Chin Fook Weng, with the celebration culminating with the traditional lion dance to usher blessings. Tan Sri Dr Koh offers oranges to the ‘lion’. During the event, a donation box was placed at the entrance to invite collections in aid of Assistant Library Supervisor, Zubaydah Zamri, who is away on unpaid leave to take care of her 21-month-old son, Muhammad Muhaimin Abddulah. Her son is suffering from neuroblastoma, a type of cancer, and he has been admitted to Penang Hospital since January 18th. A big thank you to everyone as about RM5,000 was collected! Grace Lau (centre) receives donation from the staff of Heng Lee Group.